I’ve never been a big fan of Valentine’s Day. From the moment Christmas ends till the moment Valentine’s Day is over, you can’t walk into a Duane Reade to buy some Advil without being assaulted by aisles full of ugly teddy bears. It’s just tacky. Whether I was single or coupled, I’ve always been in sort of moral opposition to a holiday concocted to make people buy lots of pink and red junk and feel bad if you’re not going out to dinner. But on the other hand, really, if you just look at it as an excuse to eat chocolate, it’s kind of acceptable. I have to admit, this year was an exceptionally fun Valentine’s Day. Homemade dinner of linguini with littleneck clams and spicy tomato sauce, fancy French wine, a box of Jacques Torres chocolates, and homemade whoopie pies! 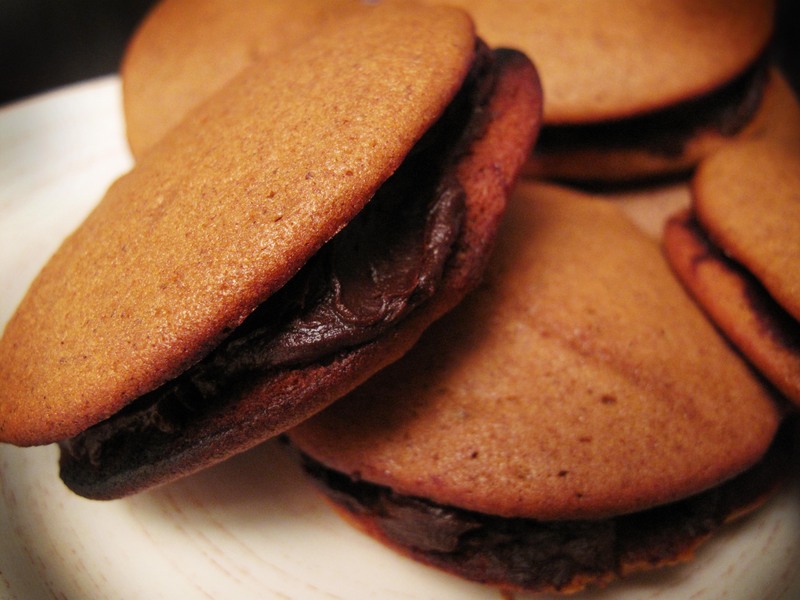 For non-New Englanders, whoopie pies are traditional Maine desserts that are basically two mounds of chocolate cake/cookie with creamy filling in the middle. They look a little like giant Oreos. So Chris’s mom had gotten me a whoopie pie cookbook for a Christmas stocking stuffer, with a card that said “If you’re going to date a Mainer, you have to cook like one!” The book has not only the traditional chocolate cake with buttercream filling recipe, but more than 20 cake and 30 filling variations and 4 pages of combination suggestions. They even have a jalapeno cornbread whoopie pie, a maple bacon filling, and two completely vegan recipes. Deciding which whoopie pie to make was probably the hardest part. I was intrigued by the Happy Pilgrim (pumpkin whoopie, maple filling) and the Chip n’ Dale (chocolate chip whoopie, salty peanut butter filling), and Chris liked the Hansel & Gretel (gingerbread whoopie, buttercream filling) and the Crazy Mo-Fo (chocolate on chocolate). For the gingerbread whoopies: Sift together 4 cups flour, 1.5 tsp each ground ginger & cinnamon, 1 tsp each salt & baking soda, 1/2 tsp cloves, 1/4 tsp nutmeg. In a separate bowl, beat together 1 stick unsalted room temp butter, 4 tbs vegetable shortening (I actually used all butter for this which is why they came out kinda flat), and 3/4 brown sugar until fluffy & smooth. Beat in 1 egg & 3/4 cups molasses. Add 1/2 the flour mixture & 3/4 cup buttermilk, then the other half of the flour mixture when blended. Drop about 2 tbs batter about 2 inches apart onto a parchment lined baking sheet and bake for 10-12 minutes (you’ll need to do more than 1 batch). Cool on a wire rack. For the chocolate ganache: Heat 1/2 cup heavy cream in a pot or microwave & pour over 8 oz chopped semisweet or bittersweet chocolate. Stir till melted. Cool. 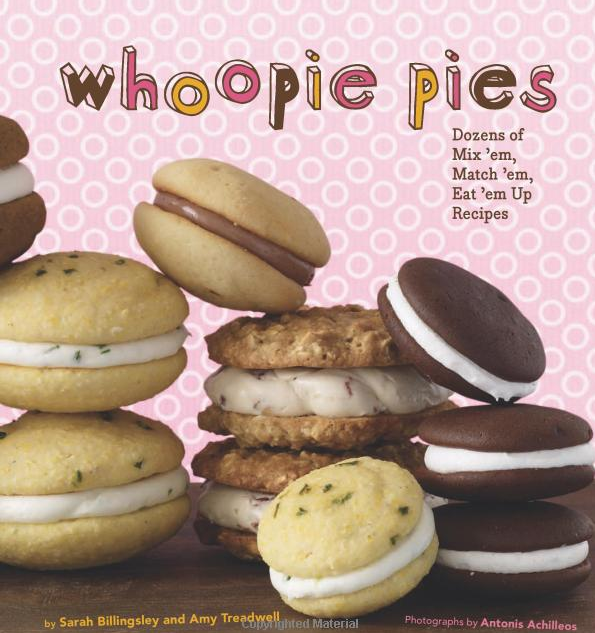 Then assemble your whoopie pies!